In this section, we will cover how to make the SVG Coordinate Space dynamic so that our Data Visualization is visible regardless of the data. We will the make the SVG Coordinate Space scale up and/or down to fit our data. (similar to our example in the Using JSON to Simplify Code section). has a width of 100 units and a height of 100 units. Which means that the lower right most point of the red rectangle lands at (90,90), which is still inside of our view port. What if our purple rectangle x-coordinate, suddenly quadrupled from 40 to 160? This would mean that the purple rectangle would have x,y coordinates of (160,40). This coordinate is out of our viewport which has a width of 100 units and a height of 100 units. As you can imagine, This is not good!. 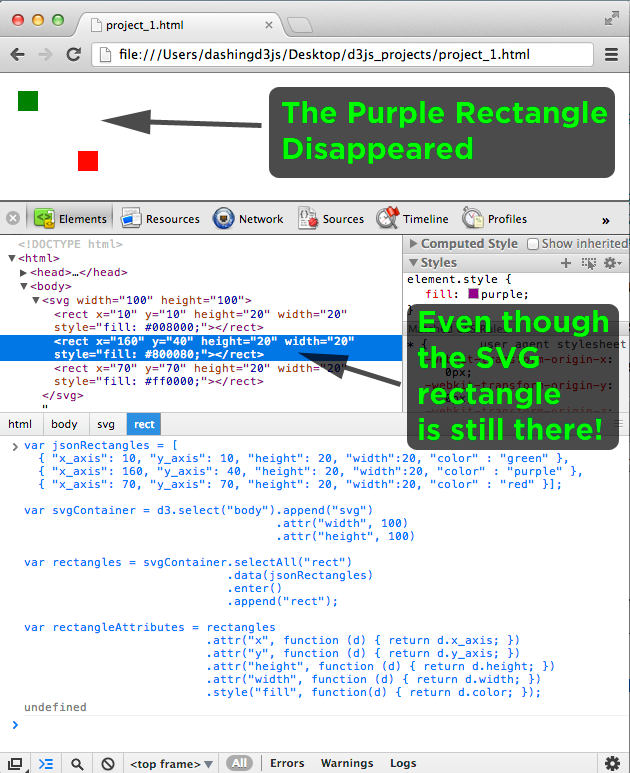 To get our new data to fit inside of our SVG container, we would have to increase the width of the container to accommodate the new x-coordinate for the purple triangle. It will have coordinates (160,40) at the top left and (180,60) at the bottom right. Which is great, until the x-coordinate increases again. Or, the y-coordinate increases, or ... etc. As you can guess, what we really want to do is to dynamically change the width and height attributes of the SVG Container/Viewport according to our data. The max x-coordinate and max y-coordinate will be the bottom right hand point of the rectangle. 24  * otherwise, do nothing. 33  * otherwise, do nothing. If the data changes, this max_x and max_y will always have maximum values of our data. 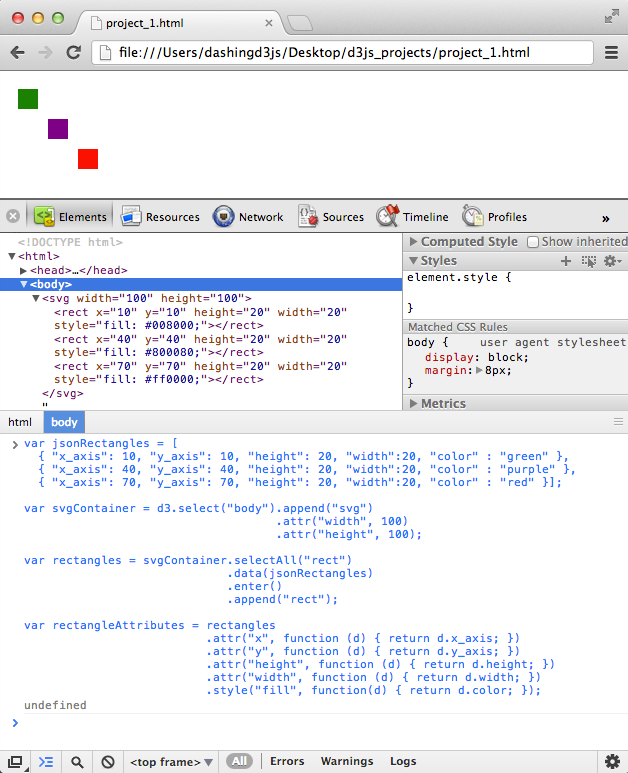 Notice the note - we add some space to the max_x and max_y to give the elements some stylistic room. In this way, our SVG Container will now always display the right dimensions so that the data fits correctly inside of it. All of the rectangles are there. 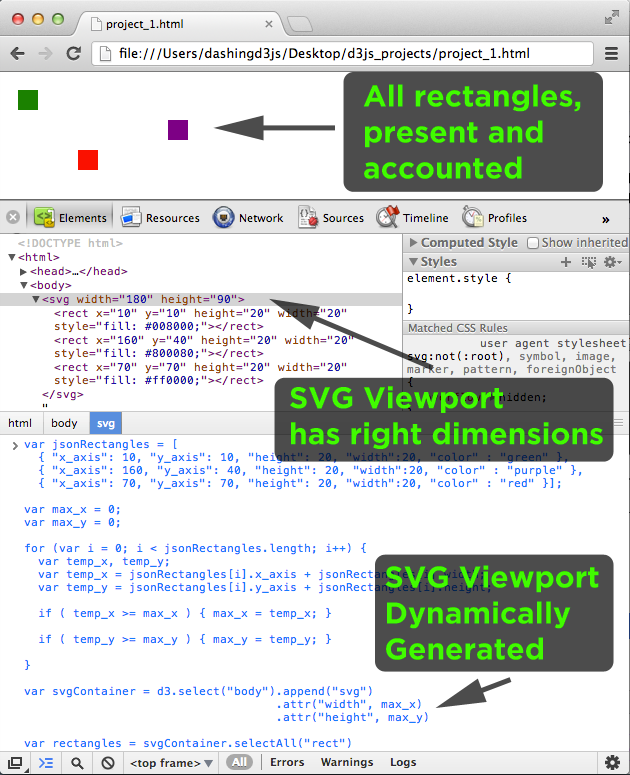 The SVG Viewport has the right dimensions (max_x + 20, max_y + 20). 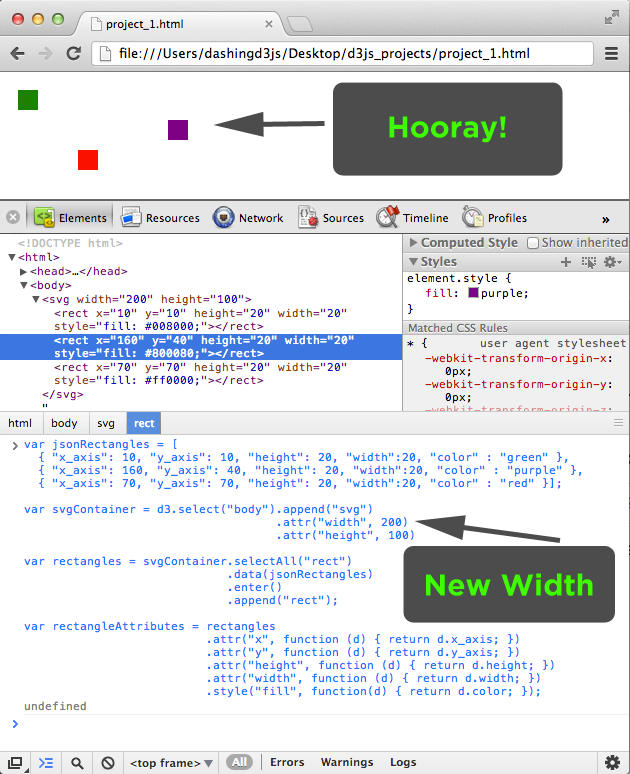 And the SVG Viewport was generated dynamically so we didn't have to manually update the width and height. So if/when the data changes again, this viewport will be ready to contain all of the Data Visualization.